HAPPY BIRTHDAY! Your special day is coming up! Let us make it memorable and easy with 2 hrs of exclusive use of Bay & Bee! The perfect backdrop for any 1st to 5th birthday celebration. Let the children play, while adults get to socialize with each other. We provide a fun, clean, open space for play. Where children and adults can relax and enjoy time together. 10 minutes to say good bye. Two staff members to set up and help facilitate your party. Cutting and service of cake/cupcakes and beverage service. Clean up. We will pack it all up and take it back to your car. Bring as many adults as you would like. Our party table seats 14 children, so if you plan on having more children, please let us know in advance. Parties are great as simple celebrations, but if you like extras, keep reading below. Add ons can be booked after initial booking with our party coordinator. If you like a lot of decorations and set up , awesome! This will require extra set up and take down time. 10 extra for take down. A place setting for 14 children and extra plates for adults. Includes, Food plate, desert plate, napkins, utensils and table cover. Get 12 latex Balloons, choose 1-2 colors. Buy your entire party socks for them to wear and keep! 30 minutes more to celebrate! Add 30 minutes of extra time to spend with your friends. The 4:30pm party will start at 4:30pm and end at 6:30pm. Live Music adds a special touch to any party. Add 20 minutes of bubble machine time! A hit for any party! The goodie bag of play! Goodie Bag with 1 day pass of play to Bay & Bee for each of your children guests! Things to know before you book. 1. How do you structure a party? We can work with you to find the best flow for your party. Most parties look like this timeline. 10 Minutes of Good Byes. During this time staff will clean up and load your car. 2. What do the guests do? Adults are able to mingle and socialize while the children play. There is plenty to do to entertain! Build and play with a 36ft train track, explore the Cedarworks play set and house, create something with Tegu Magnetic Wooden Blocks, become a super hero or doctor with our dress up selection, enjoy a tea party or pretend farmers market outing, make an art work masterpiece, discover all of the puzzles, books blocks and fine motor skills toys by Haba and Plan toys! There is so much to do, you won’t want to leave. 3. What is the maximum number of children at a party? We recommend 14 children to fit around the party table, but if you would like more guests we are happy to accommodate with advance notice. 4. Can I arrive early to help set-up if I am bringing the decorations? If you are providing the decorations for the party we recommend dropping them off in advance with the exception of balloons which should be brought the day of the party. We will help you set-up your decorations before the party begins. Please bring decorations pre - assembled. You may arrive 20 minutes before your party begins. Please keep in mind that there are only 20 minutes to set up your party. You will have 2 staff members to help you, but that time does go quickly. If you are bringing balloons, they must be filled off site. Balloons take a while to blow up and we do not have a helium tank. - We have plain table cloths, but if you 'd like to bring your own please bring 2 round, 3 Rectangle. There is one 2.5"x 6ft table for food. a 5x6" square table (which uses two standard table cloths) for children to sit at. Food should be brought the day of your party. 5. Do you require liability waivers to be signed for parties? Yes. All visitors must sign the liability waiver. We will make every effort to make this as quick as possible and not interfere with your party. 6. Can we hang balloons outside to direct our guests to Bay & Bee? Due to Shopping Center policy we can not allow balloons or signage to be placed anywhere outside of the building. We do draw a Happy Birthday chalkboard sign for you that we can put balloons on. 7. 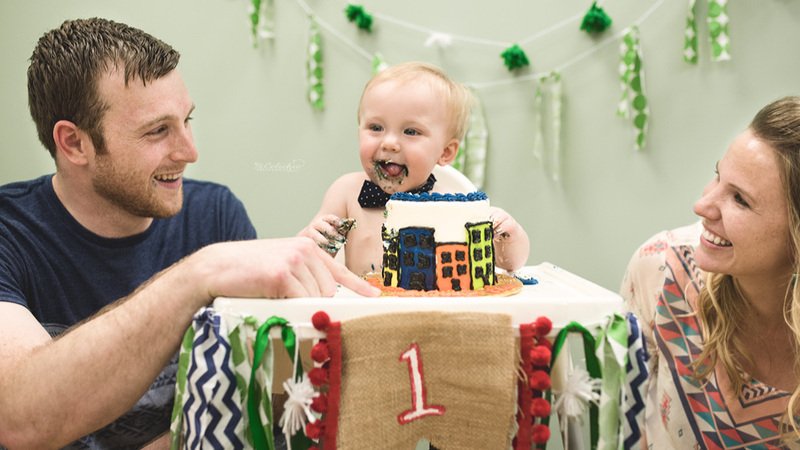 Can we bring a smash cake to a 1st birthday party? You may bring a small smash cake for your 1st birthday child! We ask that you be considerate of the mess it makes and ask that it be done at the end of the party. Bring a towel for easy clean up. Please clean the birthday child before they resume play. 8. Do you allow drop-off of children for private parties? Sorry, we do not allow drop-off's since Bay & Bee is not a child care facility. Each child must have a guardian at all times. 9. Do we need socks? Yes! Please let guests know that everyone over the age of 5 needs to wear socks in the play space. If a family member cannot wear socks, please let us know in advance. You can also purchase a sock bundle for $10 to cover all of your guests. 10. Is anything not allowed? We are unable to allow pinatas, live animals, glitter or confetti. In the event you need to cancel your party, you can re-book for a different day at no extra charge. Full Cancellations, with notice 48 hrs before your party date, $50 is non- refundable. Full Cancellations in the 48hrs window are non-refundable.